ElliptiGO is excited to announce a new team sponsorship of True Blue Elite, a training program comprised of professional track athletes living and training in Ann Arbor, Michigan. The name “True Blue Elite” comes from the fact that all the athletes on the team are graduates of the University of Michigan, and have been coached through college and, now, professionally by Michigan Women’s Coach Mike McGuire. Coach McGuire has built quite a resume during his 28 years coaching the Lady Wolverines, including their most recent Big Ten Cross Country title, McGuire’s 17th conference title and 3rd consecutive in Cross County. The Michigan Cross Country / Track & Field programs first introduced ElliptiGO integration for their athletes in 2014. This has made partnership so natural for the ElliptiGO Sports Performance team, as all the members of True Blue Elite’s roster have already had several years of experience and success with the product. They join the dozens of ElliptiGO supported training groups across the country, including Bowerman Track Club, ZAP Fitness, Brooks Beasts Track Club, Northern Arizona Elite, NJNY Track Club, Team USA Minnesota, Oregon Track Club Elite, Raleigh Distance Project, New Balance Boston, Altis World, and many others. The True Blue Elite roster has included some of Michigan’s most decorated middle distance athletes, including 1500m specialists Amanda Eccleston (4th at 2016 Olympic Trials), Nicole Sifuentes (2014 World Bronze Medalist), Shannon Osika (3rd at 2018 US Championships), Jamie Morrissey (2018 Big Ten Champion), and recent add Jaimie Phelan (2017 NCAA Champion). Any athlete or coach in the sport of Track & Field knows that injuries are a very real risk that needs to be considered whenever constructing an athlete’s training plan. Many athletes have learned from experience that their bodies can’t handle really high mileage. Smart athletes like Eccleston learn how to adjust and adapt with specific training plans that cater to what works for them, and not necessarily what works for others. Although, even with a smart training approach, no athlete is immune to injury and therefore needs to have a plan for if and when those injuries arise. 2018 Big Ten Champion Jamie Morrissey was having her best season of her career this past spring, but had to undergo Achilles repair over the summer and take a significant break from running. This made the ElliptiGO a very welcomed resource. “The ElliptiGO has been a crucial part of my return to fitness. I find it to be the best mode of cross training for my Achilles. The normal elliptical machine puts a little too much stress on it,” Morrissey said. There are really unlimited ways that ElliptiGO training can be integrated into an athlete’s regimen. With as much cross training as Eccleston has done, she knows how much she should be implementing and where it will bring the greatest results. “How I use the ElliptiGO depends on how healthy I am feeling and what stage in my training I am at. When I’m injured or coming back from an injury, I use it both to add onto runs or simulate runs for some workouts. When I’m in the final phase of training, leading into important races like National and World Championships, I use the ElliptiGO 1-3 times a week, usually to add on to an easy run day, for a shakeout, or to simulate an easy run completely. It gives me added volume and aerobic work without all the pounding.” Amanda shares some more detailed cross training integration in this athlete spotlight. All True Blue Elite members have been building their strength and foundation this fall leading into the upcoming Indoor and Outdoor Track seasons. They can be followed collectively and individually on all social media platforms, including their team Instagram page. We’re excited to support these great athletes in our sport and look forward to celebrating their continued success in the seasons ahead. 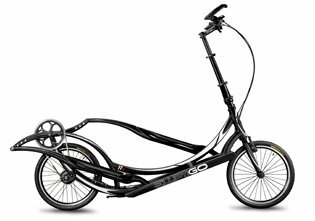 For more information about the use of ElliptiGO training for athletes and teams, please visit our Athletics page or contact us to talk with our Sports Performance Manager.